Uninformed internet hoards react strongly and swiftly when somebody appears to violate one of their pet causes. Especially if it’s a literal pet cause. Shockingly, outraged internet mobs can sometimes go a little overboard — and wind up killing somebody. It’s not a fluke: A colleague of Norah ‘s got raked over the coals on Facebook after a standard procedure went bad for reasons beyond her control. 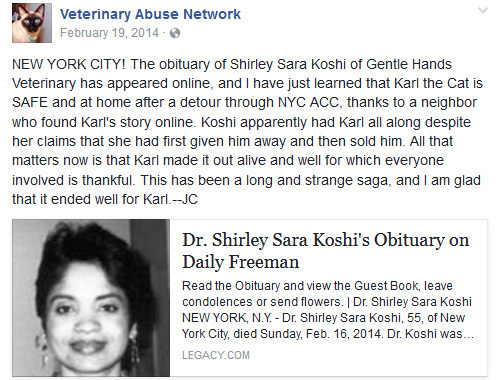 The animal was fine and the clinic covered the expenses to quiet the online furor, but Norah’s colleague was traumatized by the grisly, inaccurate Facebook post that was shared more than 2,600 times. She decided to move out of state. Jennifer can relate all too well: A couple of months after Koshi’s death, Jennifer had a bizarre run-in with a cat-owner from hell — and it ultimately led to her shuttering the clinic she’d owned for five years, declaring bankruptcy, and moving — you guessed it! — out of state. Like Koshi, she was simply looking out for the cat. The woman became belligerent and threatening, Jennifer says. A re-examination showed there was nothing wrong with the cat, despite the owner’s claims. Jennifer says she began to worry about the cat’s safety. Unfortunately, the woman was a “professional” blogger with more than a passing interest in SEO. And she was pissed. She wrote her strange version of events, posted it to her personal blog, and got 85,000 hits that week. Jennifer lawyered up — her attorney had also represented former presidential candidate John Edwards, so he knew a thing or two about damage control. Her accuser backed off when Jennifer’s lawyer got involved, but from both a safety and financial standpoint, it wasn’t worth it to sue the woman. All the negative press meant loss of revenue, which meant Jennifer was unable to sell her practice. On the two occasions when she had a serious buyer, the bank would not approve the loan because of the lagging numbers, which she believes were due to the bizarre social media campaign against her. James is still getting the sharp end of the mob’s pitchfork. He started a support forum for vets, and also a resource for pet-owners to better understand the industry. Meaning that, though it’s certainly not helping, the heart of the issue predates social media. But say she refused to put that misbehaving animal to sleep, and it mauled someone — Norah’s medical director pointed out that she would be at risk for NOT killing an animal. Just because a veterinarian can offer a course of treatment for your beloved furry friend, that doesn’t mean you can afford it. And unlike their human-treating counterparts, vets are not bound by law to provide life-saving treatment (although they definitely want to). Emergency rooms and hospitals can deal with patients defaulting on payment thanks to factors like insurance and government programs. Animal hospitals have none of these fallbacks (pet insurance exists, but few people carry it, and it’s largely a reimbursement model) so if you can’t get, say, $3,000 immediately, your pet is screwed. Animal hospitals have been burned by enough delinquent pet-owners that few (if any) animal clinics will offer payment plans anymore. That’s when things get personal in the exam room, even if a vet is trying their damnedest. But vets go over the numbers with you in-room. This is arguably how the medical industry should operate for humans, too, with the doctor being straight with you about cost. It’s just that the vet can’t continue with treatment unless you agree to those numbers, and pay on the spot. And it’s going to hit. You know the worst scene in any movie? It’s when the dog dies. Now imagine living that. Three times a week. Subscribe to our YouTube channel, and check out The 4 Most Adorable Animal Rampages, and other videos you won’t see on the site!